Flickr! Need inspiration? - check out the awesome work and colour usage of some fabulous artists. For the uninitiated, Flickr is a free photo posting site. You can join groups, and add your photo's to other groups. Free up to a certain amount posted per month - after that you can get a pro account for a small amount of money per year. Today seems an appropriate day to talk about what is coming up next year. 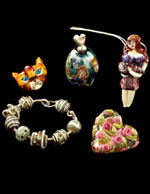 As I mentioned last week we have a number of guest instructors coming to beadFX in 2010. We also have some exciting new stuff coming from our in house instructors. Heather Bell-Denison one of our metal clay instructors is offering a number of new classes this winter. 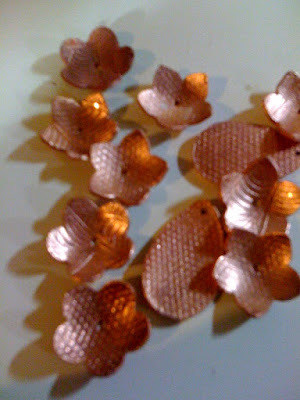 Due to popular demand and Heather's creative urges we will be adding an Introduction to Copper Clay. It is not posted yet, but the first one will be on Saturday February 13th from 10am to 5pm. Heather will be making a few changes to the Art Clay Level One Certification course, which is coming up February 26th to the 28th. It will now focus on 7 projects, not 9, and the cost will also be changing from $890.00 to $795.00. Look for these changes on the website later next week. We also have Lezlie Winemaker coming to beadFX this February. She will be offering 2 two day Lampworking Weekend Classes, February 13th and 14th and also February 27th and 28th. They are both the same class just different days. These classes will run from 10 to 6pm each day. Jennifer Tough will also be teaching more this winter. She will begin teaching fusing in January. Stay tuned for all of the details. The first weekend of January looks pretty good. We have a Glass Beading Making Weekend with Amy Waldman-Smith on January 9th and 10th. Stephanie Dixon is here on January 10th with two classes. The Wire Crochet Cuff Bracelet and the Wire Lace Multistrand Necklace. These are both for beginner level classes. Sunday January 10th is Simple Wire Wrapping Techniques with Robert Burton. This is a beginner level class. Happy Hour Torching will resume on Thursday January 7th from 5 to 9pm, buy one hour get one free. Remember to call and book your torch in advance. Over the next couple of weeks more classes will be going up on the site as well. Make sure to check every week for updates! We're still somewhat in vacation mode this week. I've got my mother in law visiting from Halifax this week - We're having a wonderful time catching up, and just generally hanging out. I thought I'd do some eye candy posts this week for you - beadmakers today. Some wonderful beads from all over the world - grab a cup of joe, and enjoy! Are you a lampwork beadmaker? Post your link in the comments! I'll be moderating off and on throughout the day. In case you've missed it, we've been posting new inspirations every day over the holidays! Check them all out here on our inspiration pages. So, having installed GIMP (Gnu Image Manipulation Program) last week - as you may remember, my s.o. recommended this as a free alternate to Photoshop. Well - I had it installed and running, and he comes along, looks over my shoulder and says, "Oh, you want GIMPshop - that's the one that looks like Photoshop - menus are the same and everything." OK - so - armed with that piece of information - I go in search of GIMPshop. And I find it readily enough - at gimpshop.com. I go to the downloads page, and select a windows download. They use a download service that, if you subscribe, you can download right away, and if you choose not too - you might have to wait. So I waited, and what with one distraction and another, got the file downloaded about a half hour later. So I selected another drive. But part of the way through installing it - I started to get dialogue boxes about "missing disk" - which I generally get when some piece of software is assuming that I have a C: drive - which I don't. The installation finished ok - and there were instructions to start and close the program, run an accompanying script and restart. OK - did that. It opened and closed. The script ran. I opened GIMPshop again. A few more complaints from the software about the missing drive. These dialogue boxes need a button that says "Get over it." But the software is up and running and looks ok on the face of it. De nada. Nothing. Ain't gonna do it. Holy cr4p. I just get the diagonal line through a circle cursor. No go. Not happenin'. That's a deal-breaker. That's so essentially Windows interface that I can't see how that wouldn't work. So - maybe I just need to re-boot. This is Windows - that's the tech support answer to everything. Turn it off and back on and see if it works now. So I did that. And tried again. And the error is repeatable. You can't drag and drop an image into it and have it open. Whoa - this is not good. So I open the original GIMP and try the same thing. Yep - that works. OK - we'll try opening an image in GIMPshop the traditional way - Pull down menus, File, Open - ok - wait a minute - there IS NO File, Open option. I stare at the interface in amazement. This is too weird. I close the software and open it again try it again. Well - at least it is consistent. Most of the menus are missing. At this point - my patience has run out. That's two hours of my life I will never get back. I suspect that there isn't anything wrong with the software, but something has gone wrong with the install. It could also be that despite it asking me where to install the software, not every part of the program is actually paying attention to that parameter, and so now it can't find missing pieces of itself. Or, somewhere in the bowels of the program - it is hard-coded to look for a specific drive (i.e. C:) - and is failing because it can't find it. Whatever. If I had infinite amounts of time, I would un-install it, reinstall on the other drive, try again. But I don't. So GIMPshop is a non-starter for me. It'll be easier to get used to using GIMP than to get this working. But - I stress to add - this is my personal experience - your mileage may vary. I'm not dissing GIMPshop - just saying that it's not working for me. I don't have the tolerance for this sort of thing that I used to have. My days of poking around inside the bowels of the computer and the software are gone - I now just want the d4mn thing to work so I can get on with it. So there you go - I wasted my time so that you don't have to. I've just discovered Podcasts. Yes - I know - I'm waaaay behind the curve on this one. For those of you even further behind the curve - they are like amateur, mini-radio shows that you can listen to on your computer or down load to your music play. Some are not so mini, nor amateur for that matter. Like blogs - they vary a great deal. However - my current fave is "A Way with Words" - which is about the English language - folks phone in with questions about obscure words or regional terms that they grew up with, and the hosts fill them in on the history and origin of the term - if they know it. For instance - someone might phone in and say, "My grandmother used to describe something really big and extreme as a 'blinger.' Like, if a storm was coming - she might say 'It's going to be a real blinger.' Is that a regional expression? "And they talk about the term and it's origin. It's totally fabulous! So grab that Ipod you got for Christmas and load it up with "A Way with Words." It's awesome. In fact - it's a real blinger! Well - can't give you a sneak peak at next week - as we're taking the week off and next week's new stuff is the same as this week's new stuff. So, instead - I'd give you a bit of a sneak peek at the coming year. One thing we definitely have planned is to expand our range of Miyuki beads. Check out the Miyuki website for the inside scoop on the sort of seedbeads that entails. Another major project that we hope to make progress on is to update the shopping cart on our website. Our requirements are pretty specific - and so we're shopping the shopping carts. We hope to add more function and flexibilty - like logging in to check your order status and wish lists. We're really looking forward to 2010 - we're planning on having a great year - and we'd like to wish you all a great year too - from all of us here at beadFX! Happy Holidays - have a lovely day today. A warm, fuzzy, sleepy-eyed everything is right with the world kind of day. Merry Beading to all and to all a Good night! I'm checking it twice so that no one is missed. and wrapping and boxing and cleaning and Whew! And a what for a whosis? - I can't read what I wrote. and some - a lost cause! Just get 'em a card! I know just exactly what the old boy should bring! for Time to Stand Still, is that in your power? Can you bring me some time, that would be fair. The world in a night? - you must have some to spare! Some beads and a pattern, some crimps and some wire! And you'll stop for a moment - it'll be just a few! But you and me - Santa - do I have you amused? We'll talk and we'll laugh, and it's just what we need! and he'll make something pretty to please Mrs. Claus. But the real secret is - it is something we know! "Merry Beading to all and to all a Good night!" And so my friends - we wish you all the very best of this holiday season - no matter whether it is Christmas, Yule, Hanukkah, Kwanzaa, Snowflake Day or ...? All the best of family and friends and joy and sharing - to you and yours - from us and ours! Last week, I promised some pictures of the fired copper - sans pickle, sans patina - so you could see it in all it's fine shiny loveliness. However, I just can't leave well enough alone. I really can't help but patina things. I use a lot of texture in my pieces, and texture lends itself well to patina. Here's what I tried to get the green/blue verdigris to develop. I used a margarine container, and poked two little holes in the lid. Using some scrap wire, I strung on all of the blossoms, and hung them close to the lid. In the actual container, I filled the bottom with about a half inch of ammonia. (don't breathe in the fumes!!). Put the lid on (with the suspended copper), and let sit for at least 24 hours (or longer). That all said, mine didn't really work all that well. I don't know if I left out some important step, or if my ammonia wasn't all that strong. I was getting a bluish hue, but not a thick crusty coating of verdigris. I'll have to try again on something else. This week and next week I will be looking at some of the upcoming classes for 2010. We have a lot of great stuff coming up as always, but a lot of it is new! One big advantage to attending a big show like Bead and Button is to take classes. We know that not everyone can hop on down to shows like these, so we are trying to offer some of those same type of classes at beadFX. In 2010 we will be bringing a number of guest instructors. Kate McKinnon will be back in May. Michael David Sturlin will also be back next October. And a very exciting new addition is Marica DeCoster. Marcia is the author of Beaded Opulence, as well as, many other books. She will be here at beadFX in the summer. Stay tuned in the New Year for all of the details on these exciting classes! January brings a lot of really exciting classes to beadFX as well. Amy Waldman Smith's Learn to Make Glass Beads Weekend is running on January 9th and 10th and again on January 23rd and 24th. Stephanie Dixon has 4 classes in January. The Wire Bead Crochet Cuff Bracelet on January 9th and her new Wire Lace Multistrand Crochet Necklace is also being offered on January 9th. The details for this class should be up in early January. We had a few problems with the photograph so it is delayed, but it is a beautiful necklace made with the new wire lace and Crystallized™ — Swarovski Elements ™. Coming up on Saturday January 23rd is Stephanie's Wire Bead Crochet Basics and Wire Bead Crochet Mutltistrand Necklace. Heather Bell-Denison has a few classes coming up this month as well. Saturday January 16th is Charmed I'm Sure. On Sunday January 17th is the Textured Copper Rings Bracelet. This class is also changing a bit from the description on the site. 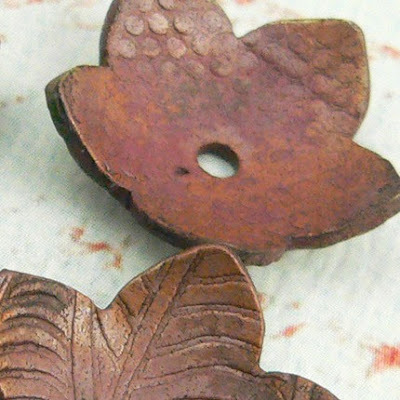 This class will now incorporate an brief introduction to ARt Clay Copper and Copper Clay. Suzanne Crudden is also offering a new and really exciting class beginning on Wednesday January 20th, Metalwork of Beaders. In this class rather than focusing on the technical aspects of professional metalsmithing we will focus on having some fun with metal. Students will learn traditional techniques as well, such as, how to saw, pierce and solder metal. Our focus will be not be project based but on skills that you will be able to practice at home with your own work. Happy Hour Torching is finished for this year and will resume again on Thursday January 7th, 2010. If you just finished celebrating Hannukah a belated Happy Hannukah! If you are celebrating Christmas this week--Merry Christmas! If you are celebrating Kwanzaa--Happy Kwanzaa! And a Happy Beading to ALL!!! When it comes to photo editing - PhotoShop is the first name you think of. The be-all, the end-all - the alpha and the omega. The gold standard. After all - it's name has become the verb that means "to alter an image digitally." Mirriam-Webster says so. However - there is no denying that, at $699 US - for the non-educational, non-entry-level version - it can be tough to justify it. Or if you can justify it - you might still not actually have it. My s.o. swears by another program - however. My s.o. is a Unix geek and mostly - his idea of wonderful software and my idea of wonderful software have very little common ground. His image editor of choice is GIMP - which stands for Gnu Image Manipulation Program. Gnu is - well - it's more than software - it's a philosophy. (To learn more about the world of computers and the free software philosophy and the world outside PCs, Windows, Mac, and the real meaning of "hacker" - go here.) The thing about GIMP is - it's free. That's oodles of zero dollars. Which has some appeal, I admit. Download and installation were painless - I'm mildly annoyed that it didn't give me a choice as to which hard-drive to install it on, as my primary drive is getting rather full-ish. But it did fine. It started up fine too - a little slow while it loads stuff. But Photoshop isn't actually a speed demon to start up either. It's one of these applications that has floating palettes so you can still see what is going on in other programs, like PS. Let's try something very basic. Crop a document and adjust the contrast. Some frustration - as I don't see an obvious crop tool. So, there is more than one to do most everything - so I find the select tool and select an area, and then find crop on the menu. OK - let's go looking for - oh looky - Levels. Hmm - this looks very photoshoppy - and works exactly the same way. What about Unsharp Mask. Aha - here is it - under filters - not quite in the same place but purdy darn close. Save, and - here's the image. OK - so far so good. So I will continue to try using it and report back next week. Cheers. Have a very merry Christmas, or if this isn't your holiday - enjoy it anyway. A holiday shared is joy increased. Some really lovely beaded creations here at Triz Designs - and beautifully presented too! Not only is her jewellery gorgeous - but the site design and presentation completely flatter her work - and her blog also ties into the same look. Whether you are inspired by her jewellery or her website - this gal is doing it right! BTW - the store will be closed from 3 pm Christmas Eve (Dec 24) straight through until Jan 2. We're sending everyone home for a good rest. Yes, torch firing - it works, and it works fabulously! Today was our metal clay play day, I got a chance to meet two of our customers that I had only 'met' online before. Carol, and Jan - It was so nice to meet you today. We tried out a couple of test packages of the new Art Clay World version of the copper clay. I made a bunch of simple little components to be used in jewellery, as I specifically wanted to torch fire - but I wasn't sure how large they could be. I only had one failure out of the lot, and that was user error on my part by not firing long enough. I found the perfect length of time to be 4 minutes. Once I got those little components out of the way, I decided to make a hollow lentil shaped bead. After it was dry, I decided to try torch firing it to see what would happen. It was probably pushing the limits of the size maximum for torch firing - but it worked like a charm! The shape stayed true, and it sintered fully. We're really excited about the possibilities of this new clay. We've got a batch coming in for sale within the next weeks! Heather was kind enough to send me some pics to post on the blog. I didn't get a chance to take any today. 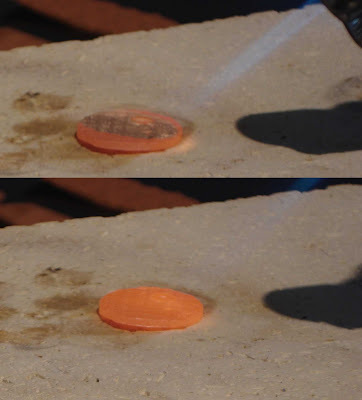 Immediately after torch firing, your piece is quenched in water. The quick cooling removes a layer of the oxidation, which you can see in the bottom of this bowl. Here's another piece that has not yet been pickled. Shrinkage - the smaller one has been fired, and the larger piece is still in clay form. Tomorrow, I'll post some pics of a few pieces I did that have been pickled. The colour is quite pretty! As we're working on our inspirations, of course we tend to work on items that we like, or have expertise in (obviously) - I'd like to know what you would like to see more of. I know we're lacking in seedbead projects, as those tend to be difficult to explain how to do - does that matter? Or do you just want to see eye candy? Let us know what you'd like to see for our inspirations. While I can't promise we'll be able to do everything that's suggested - we'll certainly try! Sorry for any confusion there! 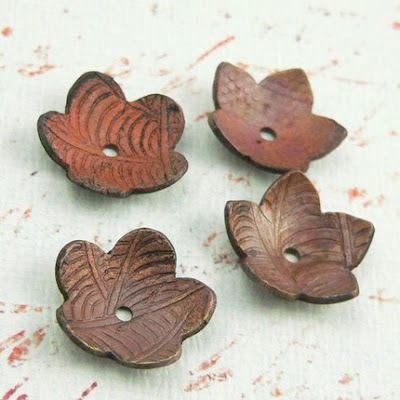 I have a couple packs of the new copper clay that I'll be working with that day. 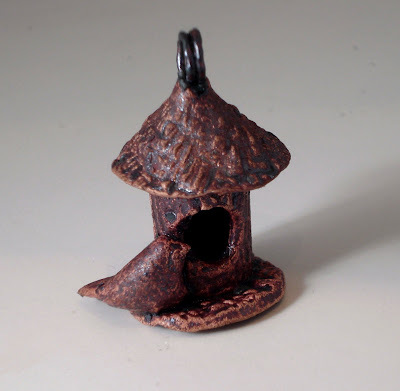 This is the new copper clay from Art Clay World, that can be torch fired. If you are at all interested in this new clay - this is the perfect time to come on by. Unfortunately, we do not have any for sale at this time. I just have 3 packages that I was able to get before they went on sale to the general public. Let's see how well it works! Sorry for the mix up last week on the blog post. I had intended to do it from the hotel--that did not work out very well! They claimed to have free internet access, which I think was dial up and we all know how well that works--it does not! Anyways, I am home and unpacking from my fantastic trip and ready to blog about the rest of the month's classes. Tonight is Dwyn's Lampworking Techniques Class--Wave Beads! This class runs from 7 to 9:30pm. Students should have some lampworking experience. A previous course at beadFX and/or at least 10 hours recent torch time is ideal, but we are flexible. Thursday December 17th is Snake Knot and Phoenix Knot Cords with Angela Peace from 6 to 9pm. This is a beginner level class. Friday is a Metal Clay Play Day from 11 to 6pm. Please call the store to sign up in advance. Sunday December 20th is Angela Peace's last class--Beyond the Button Knot from 1 to 4pm. Participants need to be able to tie a double and a single button knot. Snake or Phoenix knot knowledge is useful, but not essential for this course. This week will be the last Happy Hour Torching night of the year. We will resume again on Thursday January 7th from 5 to 9pm. Make sure to call and reserve your torch. Stay tuned for next week when I preview the 2010 winter schedule. We have some really great stuff coming up--two new metal smithing classes, more borosilicate classes, more metal clay classes and so much more! Well - I think I've covered about all I can for photography. My own camera is dying and I need to replace it - but I'm so used to it - I'm loathe to replace it. I'll recap and relink so that you have one handy place to find all the pages. And I leave you with this piece of advice - which is what made a big difference to me - but I hardly know if it will resonate with anyone else at all. The Secret to Taking Great Photographs Intro - you can do it and you don't need fancy equipment. Part 2: Three important tips and one killer secret Dig out the manual - you need to look up 3 things. Part 8: Get it off the Camera! Organizing and storing your photos. Thoughts on organizing and storing pictures. Part 10: On to Photoshop - Levels Part 2 Controlling the shadows and highlights. Part 11: And the Award for Least Intuitive Name goes to: Unsharp Mask Making the image sharper. Part 12: Ahead of the Curve(s) Increasing the contrast. With great power, comes great responsibility. Even though I've been explaining how to use Photoshop to fix mistakes - please do not be responsible for perpetrating stuff like you can see here at Photoshop disasters! On the upside - you might never believe one of those super skinny model ads again! Next week - it's Tool Time - without Tim Allen or blowing anything up. 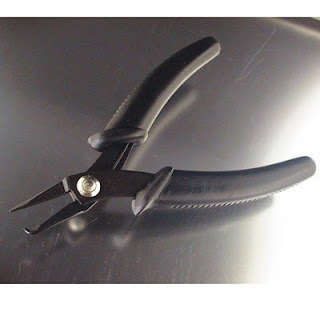 Tools like split ring pliers that really work and a copyright stamp for metal or metal clay! Just wanted to let you all know that the time that was posted for my Wave class next week was incorrect. The correct time is 7:00 - 9:30. - Tuesday, December 15. This is an advanced beginner/intermediate lampworking class on how to make my 'signature' style "wave" bead. These organic beads definitely take you outside the world of little round spacers. They capture the flow and movement of the molten glass - and make a stunning focal piece for a truly unique piece of jewellery. Space still available. Cost is $65 - all materials supplied. Some basic lampworking experience is require. Madly processing tools for next week - you might want to come down and buy yourself a Christmas present. 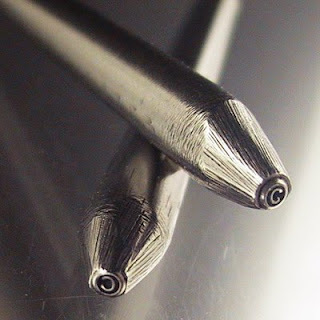 I'm working away on them now - but I can tell you - there are punches for marking metal, i.e. 925, 999FS and copyright, and hand tools, like split ring pliers the first I've seen that actually work well first time out! I've started my holiday baking, and I have to tell you I'm in love with allrecipes.com - Lot's of recipes, with reviews on each recipe. This way, you have a pretty good idea of what the outcome will be. Here are a few I've found recently that are quite yummy - and kid friendly too. According to local legend about 35 years ago, a Nanaimo housewife entered her recipe for chocolate squares in a magazine contest. In a burst of civic pride, she chose to dub the entry not "Daphne's Delights" or "Mary's Munchies", but "Nanaimo Bars". The entry won a prize, thereby promoting the town as much as her cooking. Some American tourists claim sovereignty over the dessert, referred to as "New York Slice" which is sold in many other places in the world. Nanaimo residents refuse to accept this theory, however, believing that once you set foot on Vancouver Island, there are no other places in the world. The official Nanaimo Bar recipe was available as a handout as well as on quality tea towel and apron souvenirs. In 1986, Nanaimo Mayor Graeme Roberts, in conjunction with Harbour Park Mall, initiated a contest to find the ultimate Nanaimo Bar Recipe. During the four-week long contest, almost 100 different variations of the famous confection were submitted. The winner: Joyce Hardcastle." Mint Chocolate Cookie Crunch - really yuumy! I eased up on the mint to about half to make it edible for my kids. Chocolate Brittle Surprise - I used graham crackers instead of the saltines - as that's what I had. These are really, really good! Homemade Marshmallows - These are fantastic! You really can't compare them to those blobs that come in bags at all. I got a new toy in the mail this morning which is cheering me up a wee bit. A clay core extruder for the makins clay gun. I can now make hollow core forms of metal clay. I wish I only had time to play. I can imagine it will be a snap to make fine silver hinges for pendants. ohhh...the possibilities! More tomorrow, as I'm sitting in my office getting rained on. We have buckets strategically placed just about everywhere - but I have soap supplies everywhere, and I need to move them - stat. So - did you hear the one about the doctor in Ireland. His brother had moved to America - and didn't believe any of their old parents' folk stories any more - especially the ones about the little people. He teased his brother mercilessly for retaining the quaint notions about fairies, leprechauns, and the like. So one day - the doctor actually managed to catch one of the mysterious little folk - and to prove his point - he packed up the little creature in a box and addressed it to his brother in America - and took it down to the post office. In his excitement, however, he did not do a very good job of packing - and as he handed the parcel over the counter to the mail clerk - the little man popped his head out the box and had a look around. With a look of bored contempt - the clerk pushed the creature back into the box - and thrust the whole package back at the country doctor and said: "Physician - seal thy elf." And the reason that he didn't send a photo, of course, was because we all know how photos can lie to us - thanks to Photoshop! I'm very careful - as a lot of the pictures I take are to be factual representations of actual items for sale - I'm very careful to not enhance or alter an image in any way that could be misleading. If you want to learn how to stick your brother-in-law in a photo with a dead president - I'm not your gal. If you want to see what state of the art photo-shopping looks like - check out HumanDescent.com - now THAT'S amazing. Anyhoo - notwithstanding all of that - sometimes you have a perfectly fine photo with something like a cat-hair in the background. (Geez - with 2.5 German Shedders and 2 cats in the house - that's never happened to me!) You can wipe that mark out of the photo - and not feel guilty about mis-representation. After all - that cat hair isn't included. The 50 or so cat hairs that are included - they are different cat hairs, don't you see. Most of you who have played with Photoshop will have probably discovered the "clone" tool. But I'd like to introduce you to "Spot Heal." This little tool is way cool - this is probably worth the price of Photoshop all by itself. Find Spot Heal on the palette with the rest of the tools. 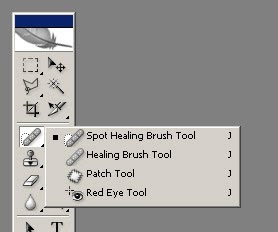 There are actually four tools sharing that spot - so if you don't see the band-aid and the little dotted circle, click and hold until you get the flyaway box, then pick the "Spot Healing Brush Tool" from the list. Then - it is as simple as clicking on your image on the offending cat hair, scratch or blemish and "erasing" it. For example - these bead are sitting on a scratched surface with a bunch of dusty particles that make it look as if the beads have dandruff. But - a little application of the spot heal - and presto - icky flaky stuff all gone. The Photoshop instructions have this to say about Spot Heal. The Spot Healing Brush tool quickly removes blemishes and other imperfections in your photos. ... : it paints with sampled pixels ... and matches the texture, lighting, transparency, and shading ... . The Spot Healing Brush doesn’t require you to specify a sample spot - (it) automatically samples from around the retouched area. However - it would be a cool site to sit down at with your kids or grandkids, nieces and nephews, etc. 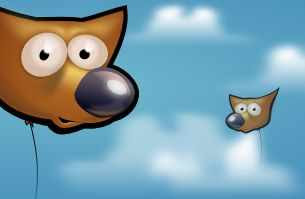 The learning part is fun - there is a short presentation on the topic in question, and then a practical application of it - which really needs your input for feedback - more fun with the two of you. The exploration phase - where you get to play and put the theory into practice - that's a lot of fun. It's all intuitive and encourage playing. And when it comes down to it - we beady people know that Art is important - it surrounds us every day and makes our lives better! Seedbead city next week. Toho 8/0s and Delica 11/0s. Lots of Permanent Finish colours replacing the old dyed colours. My kids are off on a PA day today, and we're packing up to spend the day at the Science Centre. I'll leave you with a load of eye candy for the day. First up, our very own Sue Mcnenly (Sue teaches our photopolymer metal clay classes) - Check out the mini silver dresses she's been making. Awesome! Aja Vaz - I just love her beads, and metal clay - very organic, and she makes really big beads - Betty Rubble would be jealous! : http://wanderingspiritdesigns.blogspot.com/ - gorgeous, gorgeous, gorgeous. Are you like me, and have only vaguely planned who is getting what this year? I'm actually somewhat ahead of myself, as the shopping for the kids is done. However, this year - everyone else is getting something handmade. Most of our ballot entry readers felt the same way regarding men's jewelry. They either did not want to see men wearing jewelry, or their men simply wouldn't stand for it. In either case, it was a definite no go. The funniest comment we got on that issue was (name withheld to protect the shopping habits of said customer) "The only beads I want a man near, are the ones he just paid for as we leave the bead store." Anyhoo, getting back on track. I'm making everything, from handmade soap, and jewelry, with a few sewn items thrown in to the mix. Curious minds want to know - are you done? How many of you are making the majority of your gifts this year? 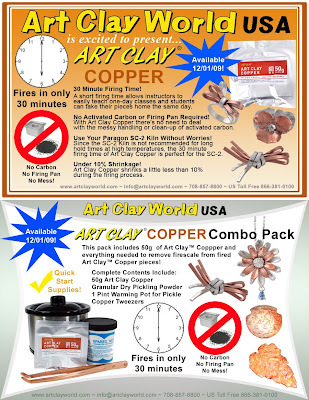 Art Clay World has just recently introduced a new copper clay that does not require the use of carbon, or a firing chamber. In fact, Heather our metal clay instructor has successfully torch fired this new clay! This is really exciting news, as the clay then becomes far more accessible to beaders and jewelry designers. As we know, kilns are a major investment. A good torch will only run you about $45.00 - cheaper ones can be had as well. You do need to pickle this new clay to remove the 'firescale'. A can of pickle, a small crockpot, a torch, and some copper pliers are far easier on the budget than a kiln! As soon as I get a chance to experiment, I'll post my notes as well. A few people have asked me who did my etsy template for jenniferbeads - I finally found her, as it was a while ago. Who can believe that December is already here! The has been co-operative that is for sure but it is getting colder. Our class schedule is a great way to escape the cold weather. Come on in and stay warm while taking some great classes. This week we have some fun new classes. Thursday December 3rd from 2 to 4pm we have 3D Snowflake Fanwheels with Maria Rypan. This is a beautiful project when they are completed and it is a beginner class. Thursday December 3rd we also have Basic Bead Stitching 101 with Cindy Vroom from 6:30 to 8:30. This weeks focus is Right Angle Weave. Saturday December 5th Marilyn Gardiner is back with her last 2 classes until April. From 10 to 12:30pm we have Earrings and Pendants. From 1:30 to 4:30 we have the Japanese Stepping Stones Bracelet. This is a beginner chain mail class. Amy Waldman-Smith is here this week also. December 5th and 6th she is having a Learn to Make Glass Beads weekend. Sunday December 6th is one of Heather's new classes, Textured Rings CopperClay Bracelet from 10 to 5pm. This class is Beginner Plus. Students should have some metal clay experience. Students wishing to take the class but have no metal clay experience may wish to complete other, simpler pieces that will be demonstrated. Tuesday December 8th is an Introduction to Chinese Knotting with Angela Peace from 2 to 5pm. Thursday December 10th is Cindy Vroom's Basic Bead Stitching 101, Herringbone Stitch, from 6:30 to 8:30pm. Saturday December 12th is the Dancing Dahlia Brooch with Nadine Foskin, from 10 to 12pm. This is an excellent gift idea! It is beautiful and is a beginner class as well. Sunday December 13th is another new class with Heather Bell-Denison, Let's Do It Together-Parent and Child Metal Clay Class! Please note: this is not a comprehensive introduction. It is intended for a fun class to make a few pieces. This class is not the same as the Charmed I'm Sure beginner's class. Children must be 10 years or older to participate. Tuesday December 15th is a Metal Clay Play Day with Jennifer Tough from 11 to 6pm. Tuesday December 15th is also a new class with Dwyn Tomlinson, Lampworking Techniques Night--Wave Beads! Students should have some lampworking experience. A previous course at beadFX and/or at least 10 hours recent torch time is ideal, but we are flexible. Call or email to get more information. Please wear old jeans, closed shoes, long sleeve cotton top and tie back long hair or otherwise dress appropriately. Don't forget about Happy Hour Torching on Thursday Night, buy one hour get free from 5 to 9pm.